Just because 3DS is out doesn't mean the DSi XL is totally dead: Nintendo knows it's onto a good thing with the giant-sized handheld, and has put together two new hardware bundles for North America for the holidays. 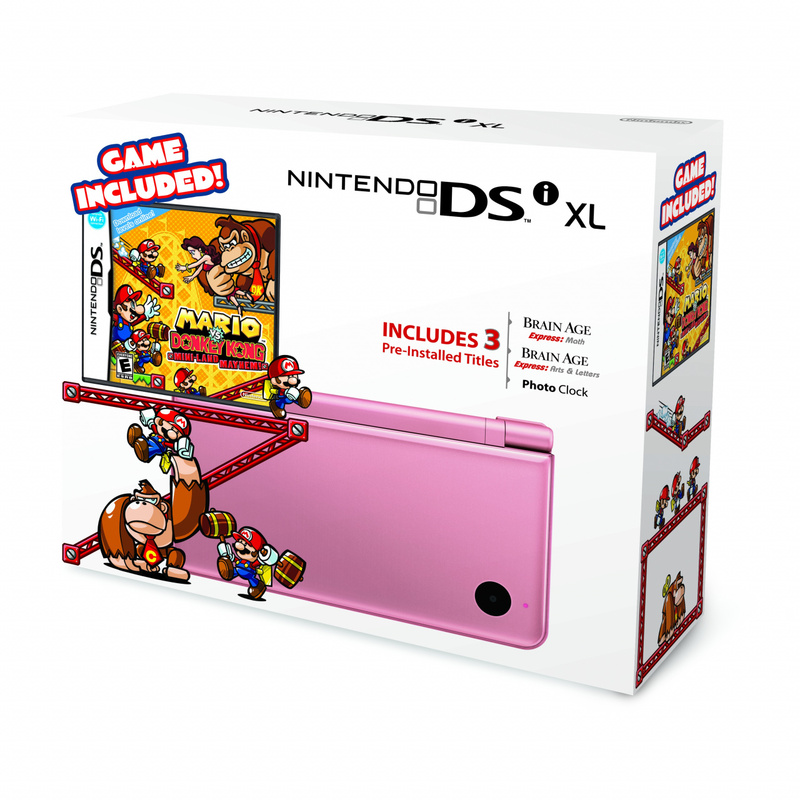 The packs are available in Metallic Rose or Midnight Blue and both come with a free copy of Mario vs. Donkey Kong: Mini-Land Mayhem!, as well as three pre-installed bits of DSiWare: Brain Age Express: Arts & Letters, Brain Age Express: Math and Photo Clock. Available from 6th November, the bundles will set you back around $169.99. Nintendo is giving value-minded consumers even more choices for satisfying everyone on their holiday gift lists. Starting Nov. 6, new Metallic Rose and Midnight Blue versions of the Nintendo DSi XL™ hand-held system will be available in bundles, each packaged with a free copy of the Mario vs. Donkey Kong™: Mini-Land Mayhem! game. Offered at a suggested retail price of $169.99 in the U.S., these colorful bundles deliver countless hours of portable fun with fan-favorite Nintendo characters. The bundles make great stocking stuffers. In Mario vs. Donkey Kong: Mini-Land Mayhem!, players must help Mario™ rescue Pauline by guiding Mini Marios through more than 200 puzzle levels filled with traps set by Donkey Kong™. Players use the stylus on the touch screen to strategically guide the Mini Marios, place items and solve different puzzles. Players with a broadband Internet connection can even construct their own levels or download additional levels using Nintendo® Wi-Fi Connection. With a strong online community constantly creating new levels, players can always find new challenges to play in the thousands of user-created levels already available, or players can contribute their own levels as well. Like the Mini Marios themselves, the fun of Mario vs. Donkey Kong: Mini-Land Mayhem! just keeps going. Nintendo regularly issues level-design challenges to players. The 20th Challenge, issued on Oct. 14, invites players to create levels involving Crumble Blocks. Players have until Oct. 28 to submit an entry, after which others can download and judge them using the Nintendo Wi-Fi Connection via a broadband Internet connection. The top vote-getting levels will be announced on Nov. 2. Be sure to check back for ongoing challenges. Beyond the included Mario game, built-in cameras and large screen, Nintendo DSi XL also offers players access to hundreds of downloadable games via the Nintendo DSiWare™ service. Users with broadband Internet access can redeem Nintendo DSi Points™ to download digital games. Nintendo DSi Points can be purchased in the Nintendo DSi Shop, or a Nintendo DSi Points Card can be purchased at retail locations. But why? How do they expect to get people to want an all new system when they're showing the public not even they want to abandon their old one yet? They really ought to push the 3DS more, especially with Christmas right around the corner. It just doesn't add up! Well there are still the much younger crowd, moms and the 55 and up crowd to consider...Not will want an 3DS. As much as I love my DSi XL to bits, it does seem a bit strange to keep pushing these. They're probably going after a different demographic to the people they want to sell the 3DS to, but I can see this just confusing people. Well, they were still selling newly-modeled GBA SPs to people while the DS was out for awhile. I guess this might be for older people. Like seriously, nintendo fans would want a 3DS not a previous console. I still play my XL as much as, or more than, my 3DS, though that will change in a couple of weeks. But I agree that this seems counterproductive. Sure, keep them on the shelves, but promotions like this probably hurt the 3DS. I agree with all of you. This promotion is just Nintendo trying to get rid of extra stock, right? I have Mini-Land Mayhem. It's quite fun. and I absolutely love the level editor. I love being creative. DSi XL appeals to the older generations for the most part, whereas 3DS doesn't. So I can understand this. 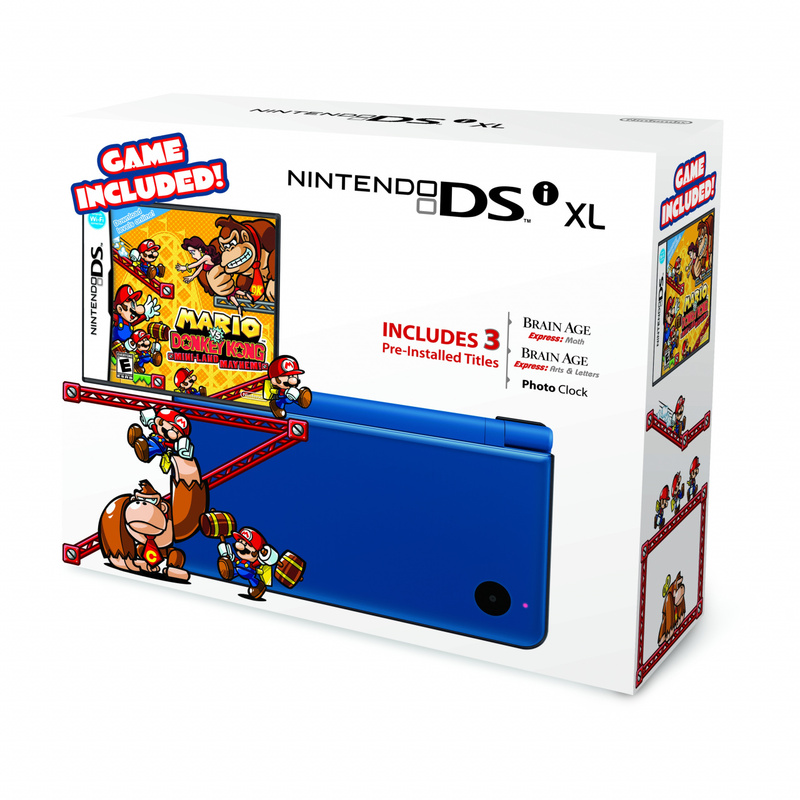 I actually think it makes perfect sense to sell the DSi XL and the 3DS side-by-side so people still have that choice. A price drop for the standalone XL wouldn't go amiss, though. Even if only by $10. Why wouldn't they do this!? The DS library is much like the ps2's library of games and systems sold. The ps2 still sold new games and systems long after the ps3 came out. Its all about where the money is and not so much which system to get. As long as they make there money this makes sense. Lets not forget that the 3ds just took a major hit in cost effectiveness. Nintendo stands to make more money of this bundle then the 3ds alone. Nintendo is not use to not making a profit off of their systems!! Its not unheard of for Nintendo to release a new version or bundle of a system after its successor came out. They released a new version of the GBA after the DS (GBA SP+). Now that I think about it, wasn't the Micro also released after the DS, or was that just the 20th anniversary thing? I would agree that they are trying to clear stock if it weren't for the fact that the pink XL just came out. "nintendo knows the 3ds is mostly a flop.. rumor has it a new handheld will be Shown at E3 2012 (video footage at least maybe working model) and a new system will hit late 2012 to 2013"
This is the first I've heard of this, and I'd be shocked if it were true. Nintendo is all-in on the 3DS. There's a huge lineup of third-party titles for next year — developers wouldn't be doing this if a new console were in the works. It's right the DS i XL owns a very attractive library.If we think of pearls like 'Knights in the Nightmare' and the Castlevania francise that are still in the shelf' s in your next Game Stop shop, why not still offer the device to the audience? Great bundle, but why would you do this? This is right up there with the stupid commercials Nintendo was running last spring where they were advertising the price drop on DSI and the new red case for Mario titles (no price drop on Mario DS titles, just a red case). Seriously, how stupid is Nintendo. They release a new system and continue to aggressively advertise for the old system. If I bought the DSi XL bundle and then discovered that no new titles were being released, I would probably never buy another Nintendo product. I know that Nintendo is a bit backwards in the business sense, but this is just stupid. Nintendo is currently selluing between 250,000 and 300,00 3DS units a week. It certainly isn't the 4 million in 3 days of the iPhone 4S, but it is far from a flop. OK??? So why does Europe get a 3DS bundle and NA gets a DSi bundle? That was a stupid move on Nintendo's part. Its time to put the DSi out to pasture. They could have at least made it cheaper than a 3DS. Why would anyone spend the same amount on a DSi when a 3DS is the same price and the 3DS is the better option. Hopefully this is some kind of joke. I'm pretty sure this bundle is targeted at older people, seniors and such. I can't imagine too many people being interested in this huge hulking beast. It doesn't exactly strike me as portable. These aren't new colors, it appears. Just new bundles. I'd rather have an entire system commited to these big screens and poor battery life from the get go than a fat thing that claims lots of 3d games and then expect us to add a plastic PSP looking thing with a control stick on it that makes it just as huge after the fact. Theres no way they're making "a new system" but I don't doubt a re-design as soon as 6-8 months from now. Once there's a re-design then they'll drop the old DS's. Meh, I'd rather have that other Mario game for that other Nintendo handheld, please. Poor Americans! I guess you much rather have the White 3DS + Mario 3D land bundle that's coming to Europe. Really, who still is interested in the DSi (or DSi xl for that matter)? "Simple like i said on other message boards .. nintendo knows the 3ds is mostly a flop.. rumor has it a new handheld will be Shown at E3 2012 (video footage at least maybe working model) and a new system will hit late 2012 to 2013"
Well, it's not a flop. Initially it didn't sell as much as Nintendo hoped because of the high price. But now that it's cheaper it sells much better. There is a chance though that there will be a new design soon because of that stupid circle-pad peripheral. But I would cry if the succesor would release as soon as late 2012/2013. However, I fear that the 3DS won't last for 5 years! You'd be surprised, the DS line still sells really well. Why throw that away? Next you'll be saying the PS2 should be discontinued too. There is one big difference: You can still play your DS games on a 3DS, so there is no need for a DSi anymore. Besides, if you really want to make your new console a succes you have to discontinue the old consoles. PS3 would be much more succesful if they didn't make PS2 consoles anymore! @Henmii: I dont know the succes of the PS3 doesnt depend on them making PS2 consoles. Sony would lose me as customer and many people like me if they stopped making PS2 consoles. I am on my fifth PS2 console and I can tell you it my current PS2 console broke, I wouldnt run out and buy a PS3 I instead go looking for a used PS2. The fact that Sony took the backward compatibility for PS2 games out of the PS3 is what hurt PS3 sales vs PS2. The moment they did that is the moment I didnt want a PS3 anymore. No point in ending the previous consoles life, you can still milk it out and get a bit more money. Also people might prefer the DS over the 3DS, don't forget there are some people who don't want a next-gen console or can't be bothered with a high end gaming console, when the DS can play games but do it in a far simpler way. 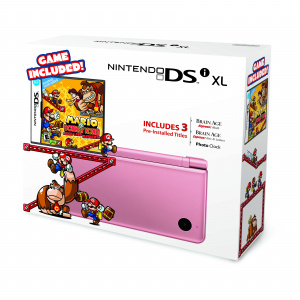 So... you can get a DSi XL bundle for $170, or a 3DS for $170. Which one will you choose? I've already had a 3DS since the launch, so I don't need this piece of junk bundle. Does this mean Nintendo will FINALLY give us that DSi SD Card update???? I think the Nintendo is just trying to make sure that they don't put all their eggs in one basket. The price is the thing that gets me. When compared to the 3DS, it just doesn't make sense. If it sold at normal price with a free game, that might be the right selling point. The major thing to consider, though, is that DS is still selling sooo much better than the 3DS. I think that's their main reason for continuing to push the DS. If it's selling, why not keep it selling. I may actually get the bundle. I do already have a 3DS, but to be honest, I would rather play my DS titles on a DS system rather than using my 3DS for it. Just today in fact, Super Mario 64 DS froze on me while playing on my 3DS while it went smoothly on my DSi. I've never had a DSi XL, and earlier this year warmed up to the DK vs. Mario 2 experience, so getting Mini-Land Mayhem! would be cool. Glad too see they are supporting the DS still. It's wise, actually! I mean, might as well get some more money from the DS if people aren't buying the 3DS. @I-U The screens on the XL are so fantastic. I can't even play DS games on my 3DS because I'm used to the clarity and size of the XL screens... if you do get a DS, that is definitely the model I recommend! Yeah, I don't mind the bundle, but it's the same price as the 3DS? That's just going to create confusion. "I am on my fifth PS2 console"
Sorry, but you are doing something wrong then. Anyway, Sony can always repair your consoles. This is no reason to keep making old consoles forever! "Simple like i said on other message boards .. nintendo knows the 3ds is mostly a flop.. rumor has it a new handheld will be Shown at E3 2012 (video footage at least maybe working model) and a new system will hit late 2012 to 2013 what will be the REAL next upgrade from the dsixl"
I very much doubt this. E3 2012 will be all about the Wii U. They'd be insane to announce a new version of the 3DS at the same time. I may buy the pink 1 for my wife. I'm sure she'ld rather have the big screen than the 3DS, we'ld give Mario to the kids (both of whom own a DSi), and she gets the Brain Age games. Note to anybody under 30 - after Halloween it's all about parents looking for presents, that's where the marketing $ go. Anybody under 30 will buy the 3DS for themselves, or pester their parents for it, this is marketing of gifts.